I haven’t worn an all black outfit in absolutely ages. In fact I have consciously been shying away from wearing black, after wearing it constantly for so long. I fell out of love with it. Today though I was riffling through my wardrobe looking for something cool to wear to the office when I came across a black dress that had escaped the great purge of January 2013. Rather than throw it into the donations bag that I am currently collating, I decided to try it on. My love of black was reignited. It made me remember that black can look great. It doesn’t have to be depressing and used as a way to cover up and hide yourself. This dress certainly doesn’t cover up much of anything on me being sleeveless and with the low neckline! I had forgotten the power of a little black dress. It is probably a little too revealing in the chest area for the office and indeed when I tried it on my first thought was “Vicky, your breasts look too big in this dress”. Then I remembered that my breasts are not going to shrink, they are what they are. It’s a boiling hot day and I want something cool to wear so I’m wearing it. Screw it. 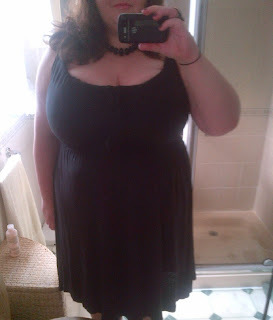 So here are a few photographs of me in the dress and I feel great in it, fat arms out and all. 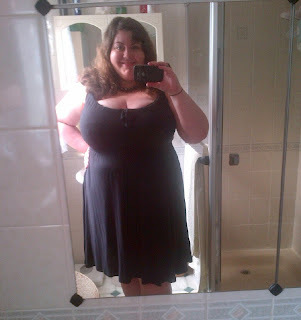 You look amazing, & confident - the power of a stunning little black dress!